Along with the ending of Madoka Magica, Wolfwood’s death is the only time that anime has actually made me break down in tears. And that’s from no lack of engaging with tear-jerking anime: I made it through all of Wolf’s Rain, Penguindrum, Fullmetal Alchemist, the ending of Cowboy Bebop…all without any waterworks. 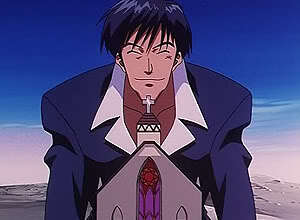 What is it about Wolfwood that did it for me? I think it’s that he didn’t want to die. And moreover, he didn’t need to die. Oh, I’m sure people will argue with me on this, but I firmly believe this. And I’m someone who can easily admit when characters I love need to die. I think Hughes’s death in FMA is a brilliant turning point and tonal shift, and can’t see how it could have been executed any other way. I think Spike Spiegel died at the end of Cowboy Bebop and it absolutely had to happen to close off his character arc and make the point Keiko Nobumoto wanted to make. And for a non-anime example: I think Don Draper needs to kick it at the end of Mad Men for similar reasons. Wolfwood didn’t need to die. 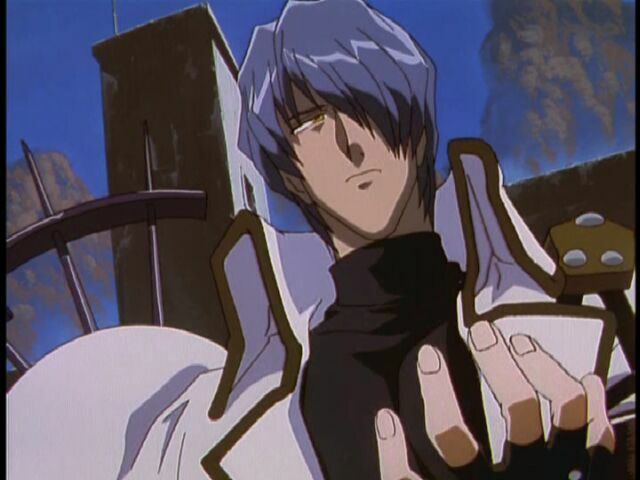 You can say he needed to be shuffled offstage to make way for Vash’s final confrontations with Legato and Knives, but I’m sure Trigun could work him in somehow or find a way to explain his absence. Heck, it does essentially work him in, since Wolfwood’s voice in Vash’s head is what pushes him along, and his giant cross-shaped gun, the Punisher, is how Vash finally triumphs over Knives. (A phrasing I think Vash would disagree with, but whatever.) 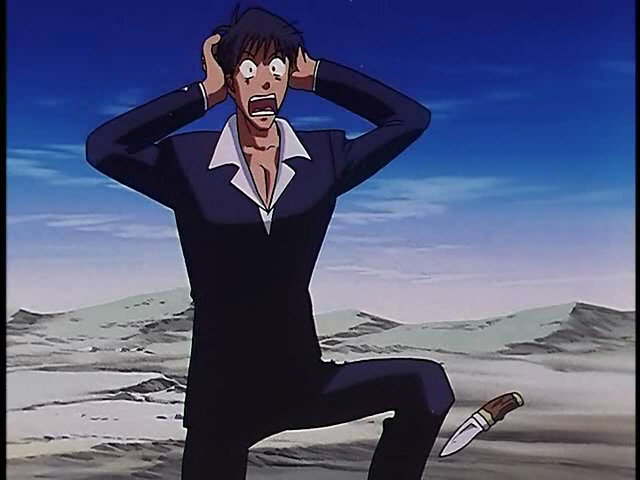 What’s more, Wolfwood knows the unnecessary nature of his death, and expresses this. The beauty of that scene is not just its exquisite direction, and use of music (I still can’t listen to “Rakuen,” Wolfwood’s theme that was used so extensively in this scene, without getting a bit blubbery). The way Wolfwood exits the world is just so human. He tries at first for serenity, to accept the inevitability of his approaching death, and muses on how he hopes to be reincarnated in a paradise where he can “live happily, with him (Vash) and the girls.” (Finally, the Milly/Wolfwood and Vash/Wolfwood shippers are united in emotional torment!) But when he takes time to really think about that dream, and how his actions in life made it impossible, he suddenly realizes he doesn’t want to die. He wants to live and make things better! His “sins are so heavy,” but that’s because he’s full of regrets, regrets he could easily make right—if only he had a little more time. “I did not want to die this way!” he screams. And then he dies. It’s so easy to write characters who go into death with an accepting smile on their faces, but I have to imagine that everyone is at least a little like Wolfwood when they’re about to meet their maker. Even if you’ve lived a long, full life, there have to be some things you wish you could’ve done when you’re stuck there, alone with your thoughts, knowing you’re reaching the end. And Wolfwood didn’t live that kind of life: his was short (remember, he’s only chronologically 17 in the manga, and the anime hints at this a few times, too), and filled with violence and misery. It feels brief to the audience, too, since as much screentime as Wolfwood’s had by this point, we only really got to know him and his backstory in this episode. A lot of my favorite anime are those that establish characters and ideas in really small chunks. For example, in FMA, we learn everything we need to know about Sloth in the three minutes right before Edward kills her, and it’s one of the series’ most masterful moments. Madoka told us everything we needed to know about Homura and her many lives in the space of a single half-hour. FMA had a big cast, and Madoka had a short runtime, so it was necessary for them to push to pull this off. But Trigun didn’t need to do this; it only had a few major characters, some of whom still didn’t get any real backstory in the anime (like Legato) in spite of the series’ ample time to do so across its 26 episodes. It could’ve taken its time with Wolfwood, but it didn’t. I think it works, because it just compounds the regrets the audience feels and represents the brief tragedy of his life. We barely knew him before he left us. He barely knew himself, only just then revealing to Vash his conflicted loyalties (“Knives is in Dmitri”) and firmly deciding to fully commit himself to his friends’ ideals. In that sense, if I were going to compare Wolfwood’s death to that of any other character in an anime I love, I would compare it to Lust’s in FMA. They were only just beginning their journeys of self-discovery when we lost them, and their deaths are full of regrets about that. But it isn’t that we’re cheated; that incomplete journey, that sentence fragment is the point. It adds to the emotional punch and realism of these stories, since this happens far too often to real people, too. How can you not love that face? How can you not cry over it? 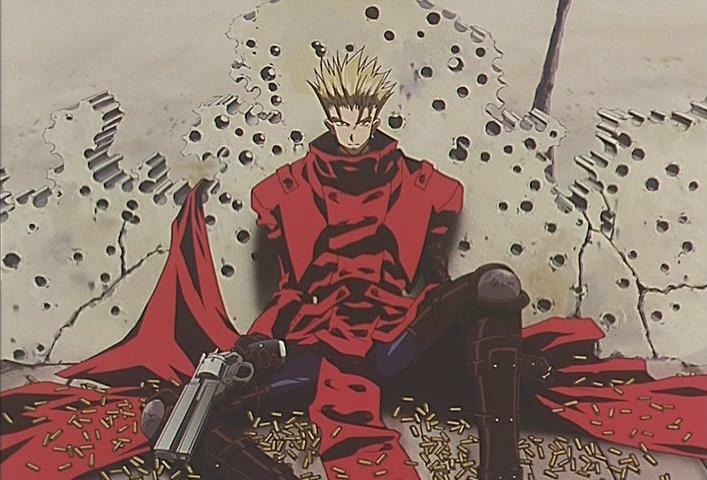 Trigun is ultimately not Wolfwood’s story, but the story of Vash the Stampede and Millions Knives, two godlike beings struggling to make sense of their relationships to humanity. Vash is a Christ figure, showing how such a “man” would be burdened and tried by the world if he’d lived longer than Jesus’s 33 years. 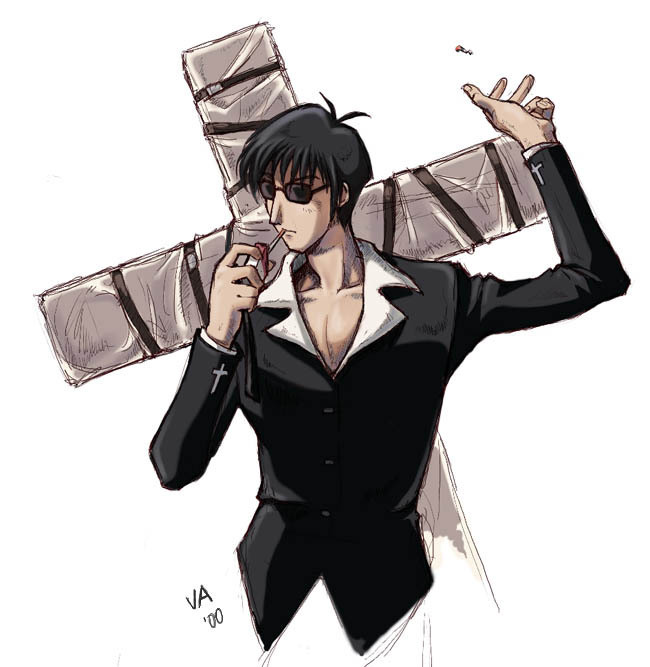 Wolfwood is the key to his bond with humanity, as Trigun’s most deliciously flawed, frustrated, human character. His death is the perfect coda to that.